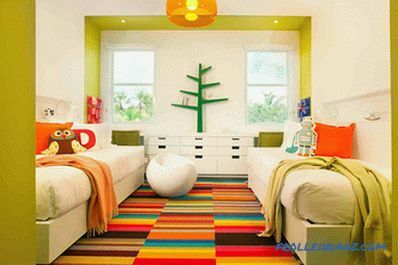 Think for a moment about using a cheerful color in the interior, and the first room in the house, which at this moment will come to your mind, will surely be a children's room. This is an ideal place for bold experiments - to liven up the space, you can try out new colors, unusual decor items or fancy patterns. True, it is often necessary to find a compromise between what you consider practical, affordable and simply acceptable, and what your child wants. Of course, widely promoted bright multicolored themes with cartoon characters look amazing, but for most of us it seems not the best option. Today we will demonstrate how to keep a neutral background in the children's room and at the same time add plenty of color to the space. When we talk about the color of a child's room, most often we are talking about painting walls. Very often the walls in such rooms are painted in bright colors - from sweet pink to cheerful red or charming yellow. But as your child grows up, such a design begins to seem not quite appropriate, and you have to do redecoration in the room. 30 stunning design ideas for children's rooms offered today for your consideration will allow you to achieve color triumph without painting the walls! Save the white or gray color of the walls in the children's room? For many, this may seem like a boring prospect. However, there are many creative ways to help compensate for the lack of color. 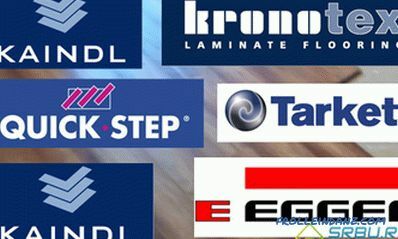 And all of them have one indisputable advantage: to change the interior style or the theme of the room, you can, for example, simply change the decor and lighting. Considering how quickly the tastes and interests of children change, this approach can indeed be considered the best. 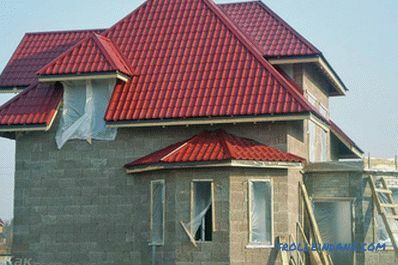 And, admittedly, more and more homeowners are beginning to understand and put into practice the functional and economic advantages of this approach. 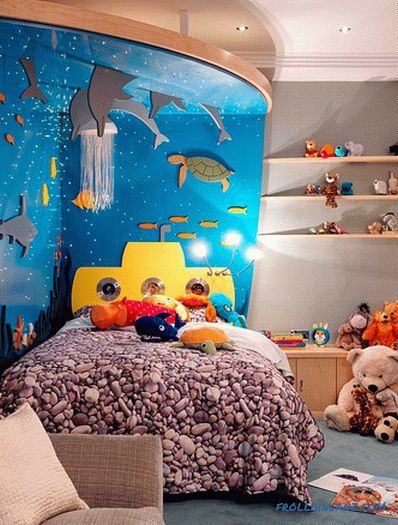 The 3D image of the underwater world at the head of the bed is a delightful addition to the interior of the children's bedroom (from Posh Playrooms ). Authentic Models hot air balloon models bring color to the modern children's bedroom (from Covadonga Cánovas ). Bedroom of teenage girls, filled with the magnificence of purple (from Helene Hollub / Ken Hayden Photography ). Decor and bedding bring color to this eclectic bedroom (from Walk Among The Homes ). You can start decorating a children's bedroom from a bed (or even from its headboard), which will attract all the attention to itself. Then add bedside tables, wall decorations and accessories that complement the created image. 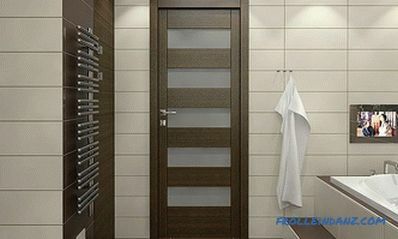 In any case, you will need to choose the color palette of the interior and stick to it. 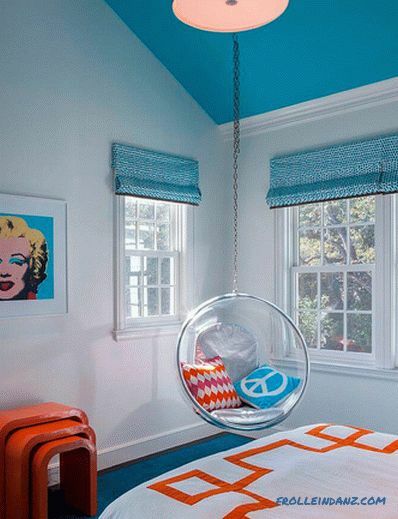 In the bedrooms of girls, purple and pink usually predominate, while in the boy's room, stylish blue shades dominate. On a neutral background, bright and shiny add-ons look much more attractive. 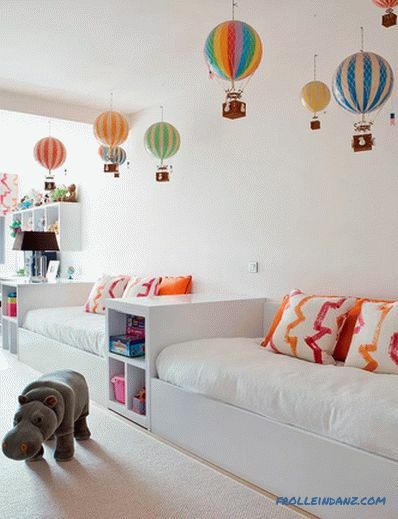 Children's bedroom that “grows” with your child (from Touch Interiors ). The inclusion of floral motifs in the design of the bedroom for girls (from Home Staging (Czech Republic)). 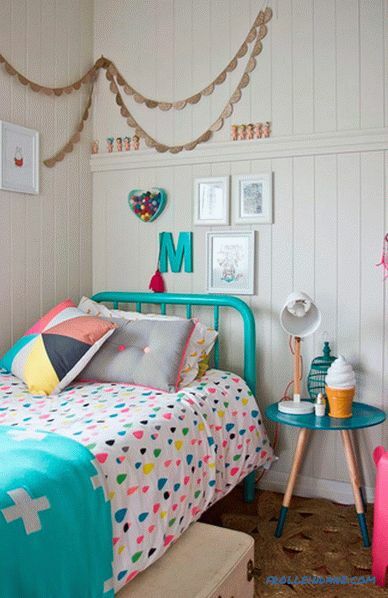 Design ideas for children's rooms in the Scandinavian style (from Ninainvorm ). Various signs and orange bicycle wheels (from Laura Manning Bendik ) were used to decorate this nursery. 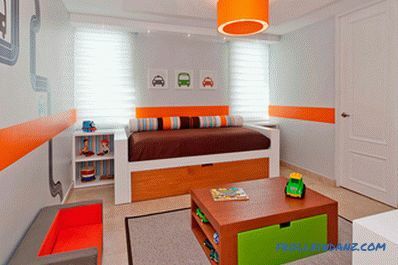 The sticker on the wall in the form of an orange band stretching across the entire room, and the same color of light under the ceiling proclaim that this room is intended for the baby ( from A lvarez-diaz villalon ). As well as the decor, shelves and cabinets play a big role in shaping the overall attractiveness of the children's room. A smart choice would be to purchase a modern modular unit that serves as both storage space and a place for homework. Such stylish furniture sets have, as a rule, a wide range of colors. In addition to the traditional pink and blue, which many parents often abuse, you can use the yellow color - this is an ideal option that looks great in almost any interior and is suitable for both girls and boys. Orange is useful when you make a room for an elementary school student. Combine this playful shade with black and it will look even brighter.Whether there are modern colorful shelves to hang or repaint an old nightstand - there are many options, and among them you can find a suitable for any style! 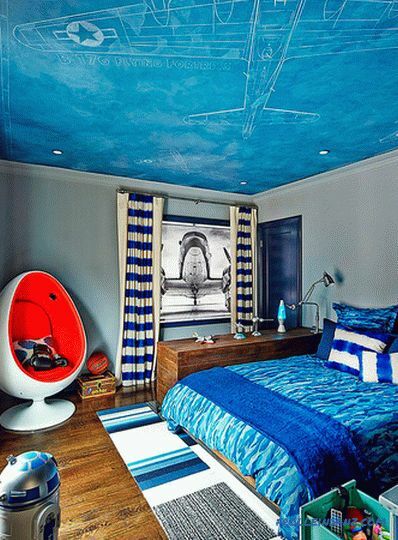 Bedroom for boys with multi-colored shelves and FLY blue pendant lamp (from Redtop Architects ). 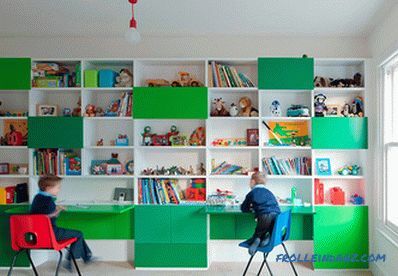 Shelves and workplaces of several shades of green in the children's room (from Paul Archer Design ). 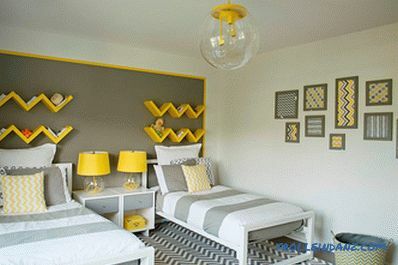 Chic yellow zigzag shelves and unusual lamps with the same yellow shades on the bedside tables are definitely favorites of this interior (from Susan Strauss Design ). Bright multi-color cabinets with built-in homework (from MATT architecture LLP ). The vintage room of modern children with colorful lockers (from Artistic Designs for Living, Tineke Triggs ). Revive the color of the walls in the nursery! Despite all the dazzling decor, do you still not like white walls? Instead of looking for a solution in a can of paint, think about creating a beautiful accent wall using wallpaper. 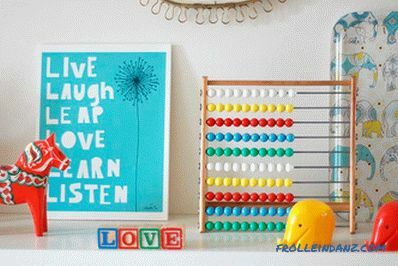 They will present not only bright colors for the children's room, but also a funny drawing, and additional texture. 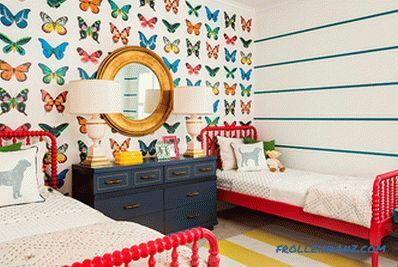 When choosing a wallpaper, be guided by the age of your child and the color scheme of the room. 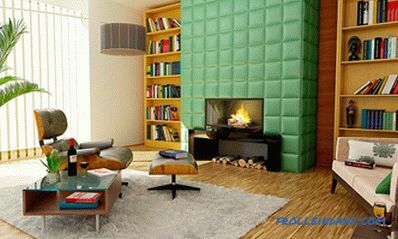 In addition, the size of the room and the surface area to be covered with wallpaper should be considered. Too bright and colorful drawing in small bedrooms can seem overwhelming. The dark blue bed and wallpaper by De Gournay with cute monkeys on a light brown background enliven this children's room (from Scott Weston Architecture Design ). Custom-made wallpapers with a picture of a world map (from Spazio Rosso ). Butterfly wallpaper by J. J Design Group. Geographic maps are a perennial favorite in children's bedrooms. 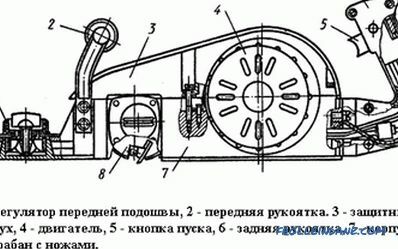 And it is no coincidence, because they give the little owner of the room not only pleasure, but also new knowledge. 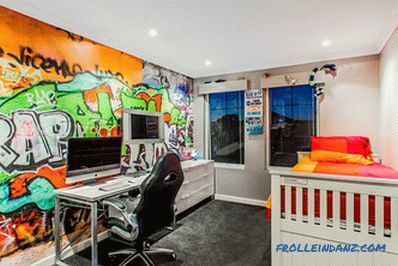 Graffiti on the wall is already for a teenager's room, and a large plaque placed on the wall will give your child the chance to turn into a master of graffiti himself! Posters, all sorts of signs and wall signs can add individuality to the bedroom. 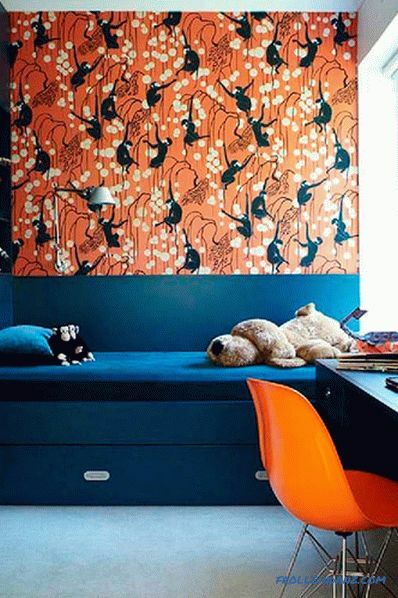 A modern children's room in orange and blue tones (from Charley's Loft Drapery and Design ). 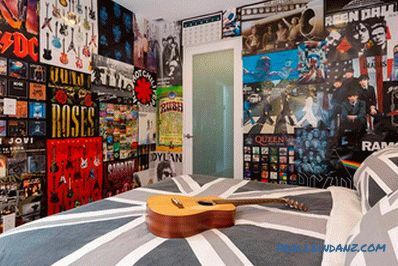 Wallpaper with posters in the teenager’s room (from Go Green Construction ). 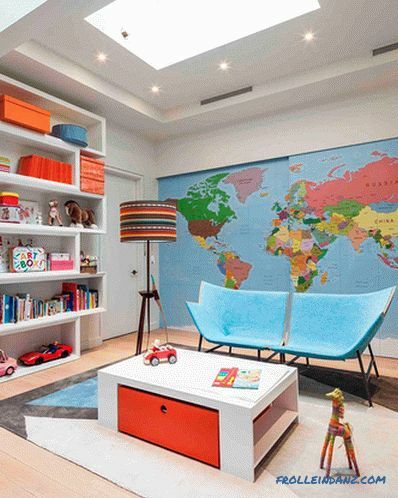 The world map and colorful decor enliven the modern nursery (from Kati Curtis Design ). 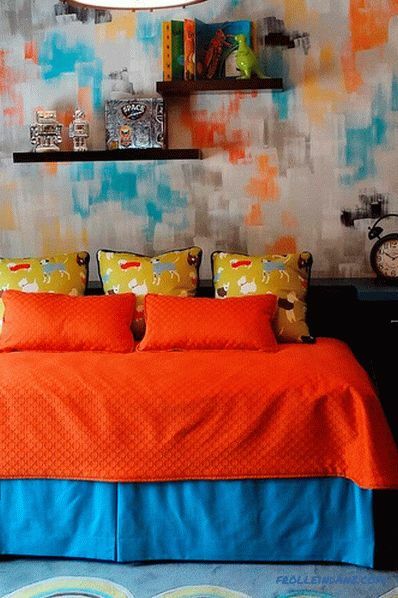 Graffiti on the wall adds color to the room (from Putra Indrawan Photography ). A colorful ceiling can dramatically change the attractiveness of a room, and it’s surprising why we don’t use this opportunity so often and don’t pay proper attention to the ceiling. In the children's bedroom, the ceiling provides an excellent opportunity for creativity: you can not only paint it, but also place different images on it - from stars and planets to your favorite superheroes. Add some unusual pendant and built-in lights, and you will have an impressive, fascinating space that seems to be full of color, despite the fact that the walls have remained "dressed" in soft dull shades. In this room, of course, all attention is focused on the unusual ceiling (from Staprans Design ). Red-orange mood in a seemingly white room (from DKOR Interiors ). Light blue ceilings and blinds in a chic teen bedroom (from Markay Johnson Construction ). The modern bedroom of the girl with spray of pink (from Gormans ). If the ceiling trick seems too risky or difficult for you, turn your attention to the floor — floor tiles, carpet, or a regular rug will help to give the room a color. Window blinds or curtains to complement the color of bedding and decorative pillows are another cool approach that will never let you down. 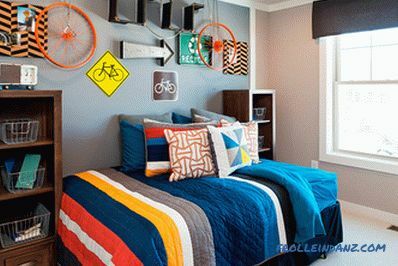 Regardless of the way in which you decide to add color to your child’s room, make sure that the interior as a whole has a consistent and concise appearance and an interesting color scheme. 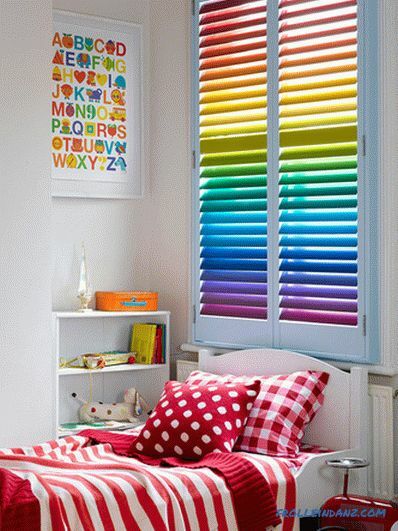 Iridescent blinds, of course, will always be the center of attention in this room (from All Shutters and Blinds - Adelaide ). A geometric patterned carpet completely transforms the atmosphere of this game room (from Stone Creek Builders ). Bright and beautiful carpet with multi-colored charm (from DKOR Interiors ). Lampshade lampshade in the form of a bird cage and a nice carpet (from Alex Findlater ). Windows framed with purple curtains add to the interior with a neutral background not only light but also color (from D 2 interieurs ).